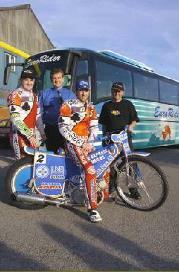 As supporters of Speedway EuroRider are taking individual bookings for this sport. · Prices are based on a twin room when sharing. If you require a single room a supplement will apply. · Tickets for events can be ordered if required. Starting 07.00 hrs Friday 20th September 2019 from the National Speedway Stadium, Belle Vue, Manchester. 2 nts bed & English buffet breakfast at Best Western Aberavon Beach Hotel & Leisure Club, Port Talbot. This is a modern 3* hotel, by the sea, which has a restaurant/bar and swimming pool/health spa. A Hotel which we have used previously and very popular with our clients. Sun 22nd September. Itinerary to be announced when the fixtures are released. Price is per person when sharing a twin room. Price does not include tickets to the Grand Prix. Starting 07.00 hrs Saturday 21 st September 2019 from the National Speedway Stadium, Belle Vue, Manchester. 1 nts bed & English buffet breakfast at Best Western Aberavon Beach Hotel & Leisure Club, Port Talbot. This is a modern 3* hotel, by the sea, which has a restaurant/bar and swimming pool/health spa. A Hotel which we have used previously and very popular with our clients.